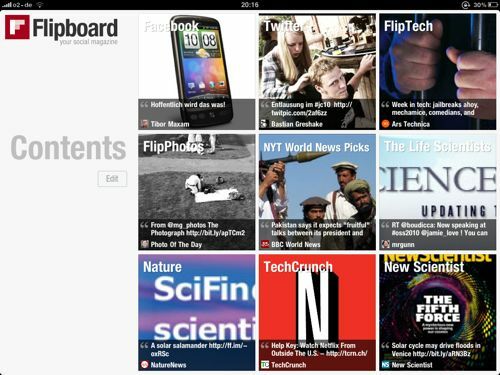 What is Flipboard? Flipboard is a personalized social magazine for the iPad. The free application was released on July 22, and instantly created a lot of buzz.It turns your Facebook and Twitter account into something that looks like a magazine. It also lets you build a custom magazine, either by choosing from Flipboard’s pre-built curated “boards” or by importing Twitter lists. This is a very powerful and engaging way to read Twitter. You can also turn a single person’s Twitter account, or a single brand’s Twitter account, into a Flipboard. For instance, you can follow Techcrunch on Twitter with it and it will turn Techcrunch into a beautiful magazine-like interface that’s easier to read than any other reader. 1. Touch an article and it “zooms” to reveal more. 2. Touch a video and it plays inline. 3. Turn your iPad and everything reconfigures, even photos switch from vertical to horizontal formats. 4. Touch “read more on Web” on longer articles and instantly be transported to the original website that was the originator of the information discussed in the tweet. 5. When you bring in your Facebook friends your friends’ photos, status messages, will all be laid out in attractive pages. 6. You can touch to share, favorite, like, or retweet, depending on what you are reading. To get a sense of how dramatically different Flipboard is from any other Facebook or Twitter client, you should watch the video we filmed with McCue where he demoed the app for our cameras. In the interview he covered the philosophy of this interesting new company, demoed the product for us, and talked about where the company is going.